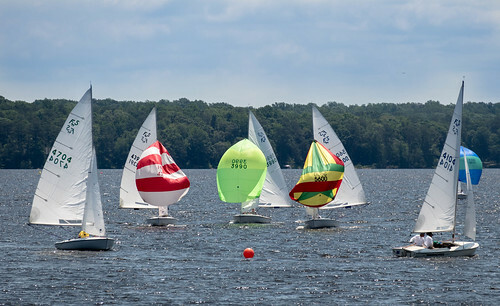 The second stop on the Flying Scot Capital District Circuit is the Greater Richmond Sailing Association Invitational. For most of the FBYC road warriors this is the one away event where you can sleep in your own bed (apologies to Len & Barb G.)! GRSA is located on the northern end of the Swift Creek Reservoir about 15 miles southwest of downtown Richmond. Gasoline powered boats are not allowed, so for the most part the sailors have the lake to themselves. It does create some interesting problems for the Race Committee; the RC boat is a battery power outboard. This causes the RC to be very intentional about setting marks, but it is a lake and the wind shifts…so the PRO will be right sometimes. The normal book on the two day GRSA invitational is one day of sailing and one day of working on one’s tan. This was NOT the case this year, as both days had wind and as is normal big shifts. 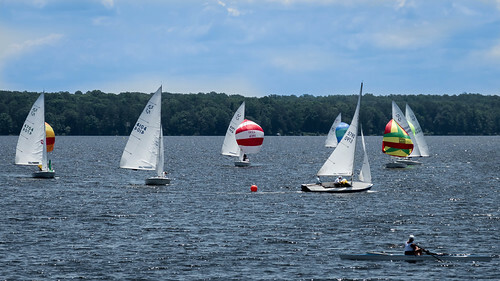 Saturday gave the fourteen boat fleet wind from the NE from 6 to 16 with sixty degree shifts. After a while you simply gave up looking at the compass and kept track of which tack/gybe was closer to the mark. The Race Committee took full advantage of the breeze, snapping off four ¾ mile windward/leeward twice or thrice around courses. Saturday night sailors were treated to a delightful dinner and libations that help forget sore muscles. Sunday was more of the same except from the southeast and comparatively less shifty (ONLY 30 degree shifts). Once again the PRO very efficiently got in three more races. Local knowledge played a part with wind coming from this direction and locals took full advantage convincingly showing that the right had to be played. When it was all said and done FBYC sailors acquitted themselves well by taking 1st, 2nd, 4th. On our boat we managed to win the battle but loose the war. In the first race on Sunday, Sharon’s ring finger on her left-hand got in a disagreement with the centerboard pennant with finger definitely losing (a spiral fracture).Let there be no dispute about her toughness though, she did two more races basically one handed!